"87. There were also a multitude of Devas, a multitude of men, and a multitude of Siddhas ; and Devi Lalità allowed herself to be seen by them all." "A multitude of Devas (Divyaugha)" the holy Brahmarşis, Visvāmitra, etc. The Siddhas are Sanaka, Narada and other Yogins. The Rudrayamala, says, “Devi was attended by many crores of rulers of Quarters, by many crores of Moons, Suns and Vasus, by many crores of Yogins such as Sanaka, and by many Saptarisis and by many Naradas." Or, the word "Ogha" (multitude) of Devas, men, and Siddhas, may mean the different assemblies of Gurus. For there are seven Gurus of Gurus (Parama-Gurus) headed by Paraprakasanandanatha, eight Parapara-Gurus headed by Gaganānandanatha, and four Apara-Gurus headed by Bhoganandanatha. These three assemblies of Gurus are indicated by the words "Devas", "men", and "Siddhas" respectively. The above explanation follows the view of the followers of Kamaraja, but according to the School of Lopā nedrã, and according to the divisions of Viclydis, as described in the Jnanarnava etc., there are many groups of Gurus headed respectively by Misranandanātha, and others. The gradations among the Gurus can only be learned through the instructions of a Guru. A large section on the different gurus in the Shri Vidya tradition follows this section, and, as in the Ganapati section of Nityotsava, these are divided into celestial, siddha and mortal gurus, both for the vidya (mantra) that begins with Ka (Kadi) and for that which begins with Ha (Hadi). The celestial gurus in the Kadi group are listed as Paraprakashandanatha, Parashivanandanatha, Parashaktyamba, Kauleshvaranandanatha, Shukladevyamba, Kuleshvaranandanatha and Kameshvaryamba. The siddha aughas are Bhoganandanatha, Chinnanandanatha, Samayanandanatha and Sahajanandanatha. The manava augha consists of Gaganandanatha, Vishvananandanatha, Vimalanandanatha, Madanandanatha, Bhuvananandanatha, Lilanandanatha, Svatmanandanatha and Priyanandanatha. At the close of this lengthy section, mantras are given for other, unknown gurus. But who are these figures? Presumably they must be ancient, since Bhaskararaya thinks the Brahmanda Purana is referring to them. Are they referred to in Hindu scripture, or in the works of earlier Sri Vidya philosophers, or what? Does anyone know their stories or when they lived? Few months ago i bought the book NityAshodasikArnava which is widely considered as a part of the most authoritative text for Sri Vidya Sadhana called Sri VAmAkeswara Tantram. In Satyayuga first Guru was Adiguru or Parama Shiva. His name was Sri CharyAnAtha. His disciple was his own vimarshini Shakti who is not different from Shiva himself. Her disciple in TretAyuga is Guru Sri OdyAn Natha Deva. His disciple in DwApara Yuga was Guru Sri Shastha Natha Deva. His disciple in Kali Yuga was Guru Sri Sri Mitresanatha Deva. His disciples were Agstya and Lopamudra. Different opinion- There are 5 divyauga pangti which ends with Sri Mitresanatha Deva. Agastya and LopamudrA's disciple was KankAltApas. His disciple DharmAchArya. His disciple was Muktakesini Or Muktakesi. Her disciple was DeepakAcharya. DeepakAchArya's disciple was his own son Jishnudeva. His disciple was Tejodeva. His disciple was Manojadeva. His disciple was KalyAndeva. His disciple was Ratnadeva. His disciple was VAsudevamahAmuni. And, his disciple was SivAnandamahAyogi. These are the 8 Manavauga pangtis. Different opinion- Upto VAsudevamahamuni 7 Manavaugas. IMO , this is the most we can know from Scriptures about the Guru Parampara of Sri VidyA. The guru paramparA of Sri Vidya consists of broadly 3 sections or "ogha" which literally means "flock" or "groups". Divyougha include Sri Kameshwara and Kameshwari , Dakshinamurti , Ananda Bhairava etc. Siddhaugha gurus include rishis like Sri Agastya, Sri Durvasa, Sri LopAmudra etc. When the ‘Prakasa’ swarupa of Sat-chit-ananda alongwith his own Sakti “Vimarsa” does the samkalpa “May I become many” ie., “Bahusyaam Prajayeeya….”, the first throb or spandana becomes “Charyanatha” who is non-different from Para Siva. Charyanatha is the Adi-guru of this Haadi Tradition in Krita Yuga. This vimarsa sakti is Mahakameswari. Charyanatha hands down this vidya to Kameswari. At the Bindu sthana sports the Adi Guru Charyanatha alongwith Kameswari. They are in the Saamarasya Bhava / Non-differential State with one another. In Kaliyuga, Mitreshanatha handed down this vidya to Lopamudra. Lopamudra teaches this vidya to Agastya. Given below the guruparampara from Lopamudra and Agastya till the recent guru. LalitA sahasranama is not the first text which talk of the gurus. Nor is the nityotsava is the first scripture to talk of these. These ogha-traya are mentioned in the most ancient texts of Sri VidyA like "parashurama kalpasutra" from which nityotsava is written in order to facilitate the nitya karma and poojas on parvAs. The ogha are mentioned in the fourth chapter of PKS in the 10th verse which is given below. As the lineage is very ancient hence it is not possible to know about all the gurus of the paramparA. We know about some of the famous sages through purAnas and other books. In rest of the cases, there is no information available about their lives. So mostly we do not get to know about most of the gurus except a few popular names. Nevertheless, all the gurus are venerated and respected during the poojAs. Lastly, Sri vidyA is not a philosophy like advaita vedAnta. It is more of a upAsana paddhati. Majority of the scriptures related to this shAstra talks more on the practical aspects rather than going much into the philosophy. Hence this shastra should not be confused with philosophies or other darshanas. Not the answer you're looking for? Browse other questions tagged mythology history shaktism brahmanda-purana sri-vidya . Who is the Samaveda-singing Brahmin incarnation of Vishnu prophesied in the Skanda Purana? 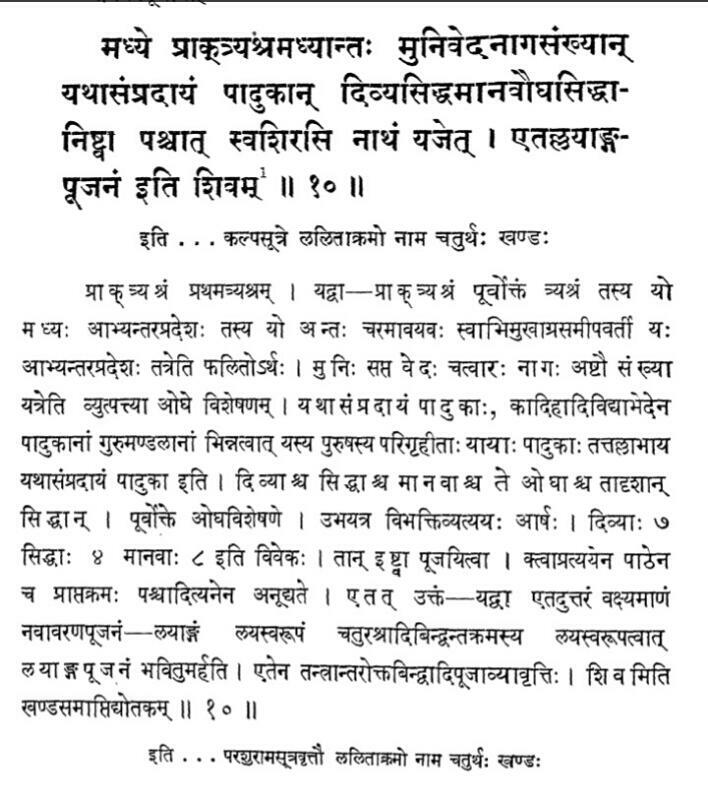 Was one of Uyyakondar's shishyas a relative of Nathamuni? Who are the Chatur Bhaginyadinis mentioned by Adi Shankaracharya?